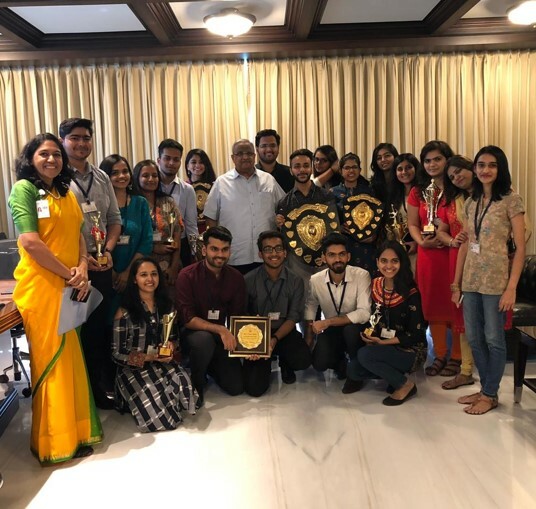 Unbeatable BNCP... 7th Time Winner of Best College Trophy in Rx Festival 2018-19. 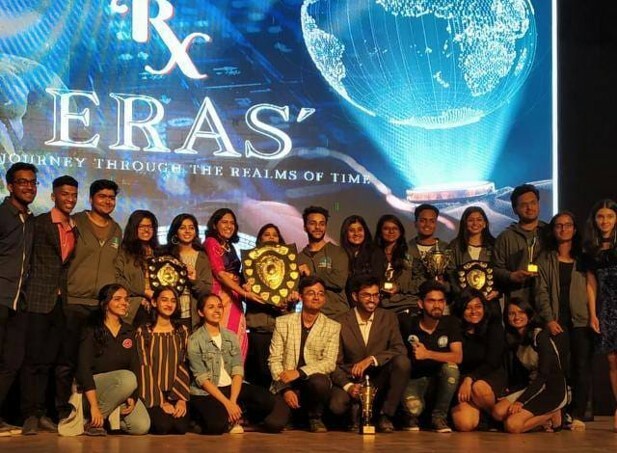 "Best College Trophy" winner for consecutive 6th Time in Rx Festival 2016-17. 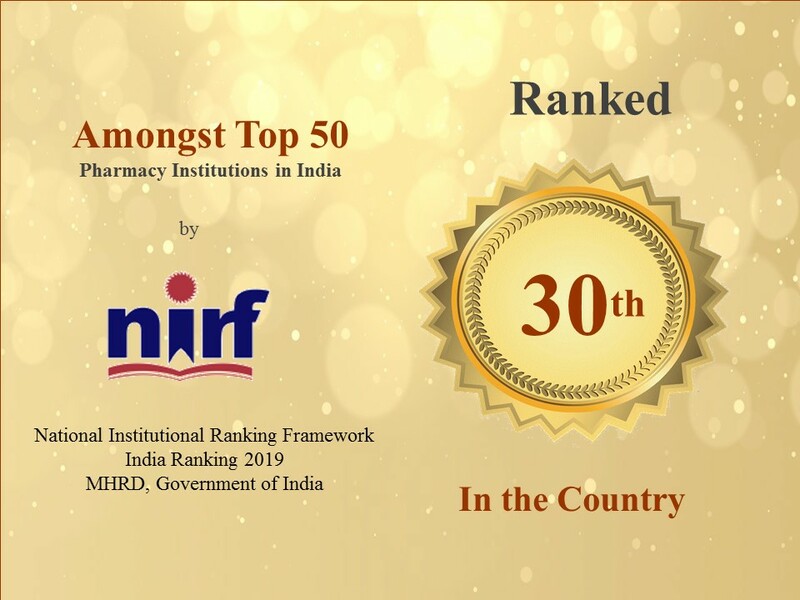 BNCP received "Platinum Category" in Pharmacy Degree College (Standard) category as per AICTE-CII Survey 2016 BNCP received AICTE-CII best Industry-linked Pharmacy Institute (Degree) award Conferred the "Best Industry-Linked Pharmacy Degree College (Established college category) National award by AICTE- CII Survey 2017 BNCP is ranked at 32nd position in All over India Pharmacy colleges and 4th Position in the city of Mumbai (Pharmacy colleges). 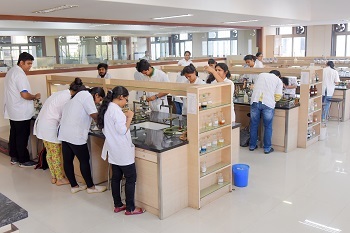 The department is involved in taking lectures of general chemistry, organic chemistry, pharmaceutical / medicinal chemistry and pharmaceutical analysis for the undergraduate students in the four year B.Pharm course. Pharmaceutics is the discipline of pharmacy that deals with all facets of the process of turning a new chemical entity (NCE) into a safe and effective medication. Pharmacology is all about “finding out how drugs work”. It is concerned with the effects of drugs on living organisms and their components such as cells, membranes, organelles, enzymes and DNA. 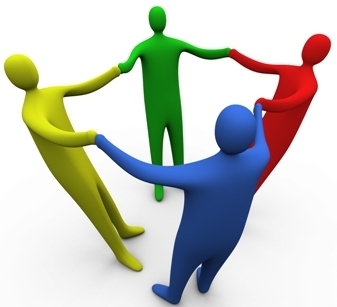 Pharmacognosy deals with the study of crude drugs that includes plants, animals and marine sources. 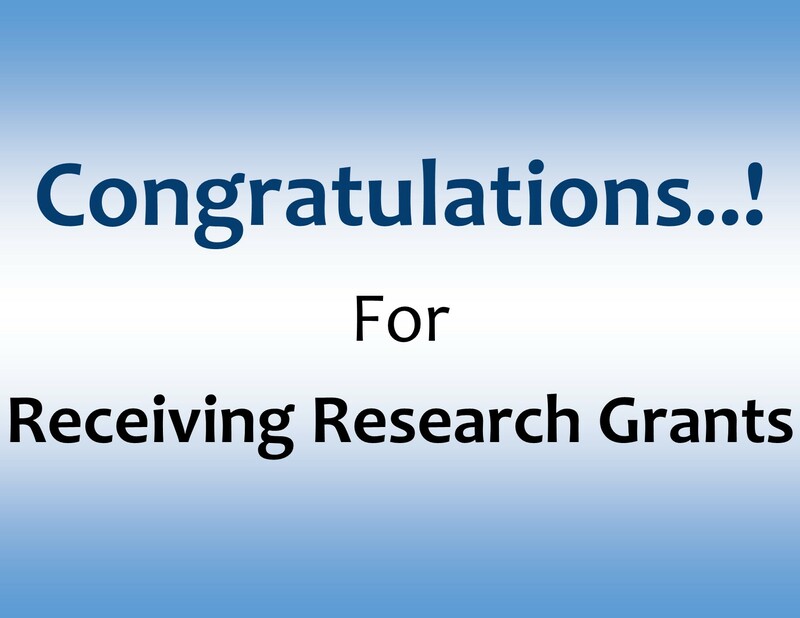 The subject has played a diverse role in the discovery, characterization, production and standardisation of crude drugs. 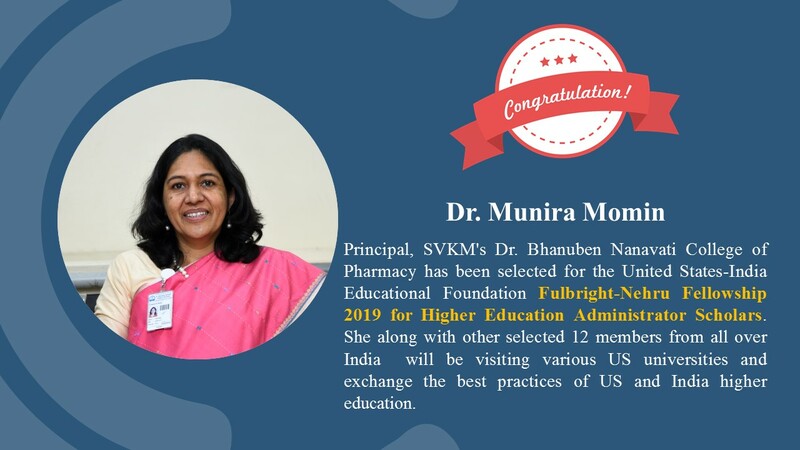 Dr. Munira Momin, Principal, SVKM's Dr. Bhanuben Nanavati College of Pharmacy has been selected for the United States-India Educational Foundation Fulbright-Nehru Fellowship 2019 for Higher Education Administrator Scholars. She along with other selected 12 members from all over India will be visiting various US universities and exchange the best practices of US and India higher education. 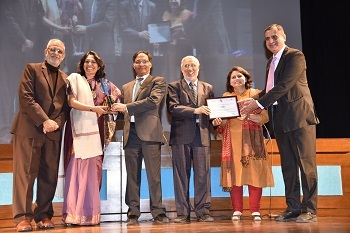 The students of SVKM's BNCP bagged the 'Best College' trophy for the 7th time, surpassing all set expectations while they secured an all rounded high by winning "Best Cultural' trophy", "Best Sports", "Best Public Health Office trophy", "Best Innovative Rural health campaign trophy" "Best World Health Day trophy", "Best Technical college trophy", 1st runner up trophy for the "Best student" in the annual intercollegiate Pharma fest, Rx held by Indian Pharmaceutical Association-SF-MSB. 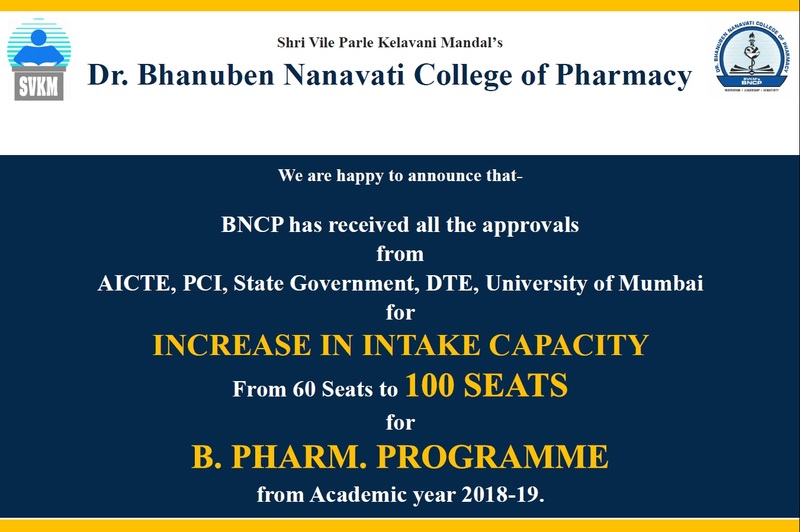 We heartily congratulate all BNCP students for this achievement. 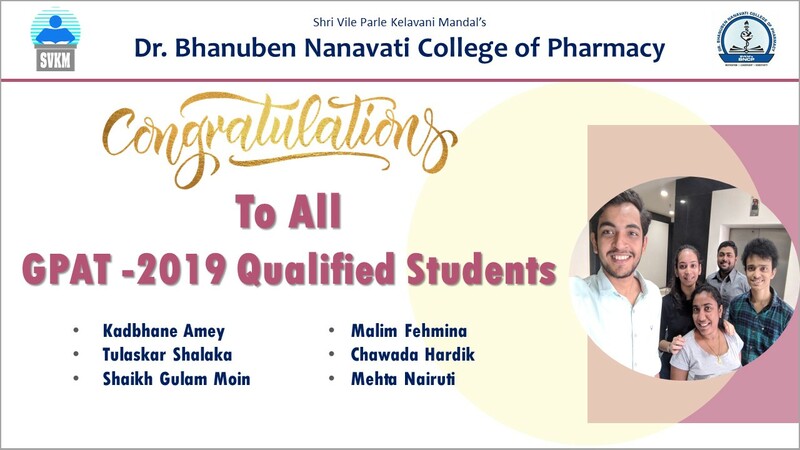 Congratulations to B. Pharm Final Year students Kadbhane Amey, Tulaskar Shalaka, Shaikh Gulam Moin, Malim Fehmina, Chawada Hardik, Mehta Nairuti for Qualifiying in GPAT 2019. 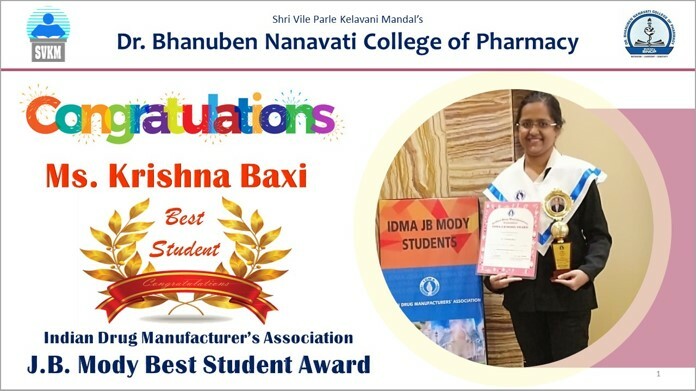 Ms. Krushna Baxi, PG student of SVKM's Dr. Bhanuben Nanavati College of Pharmacy received "JB Mody Best Student Award" by Indian Drug Manufacturer's Association on 19th Jan 2019. We heartily congratulate her for this achievement. 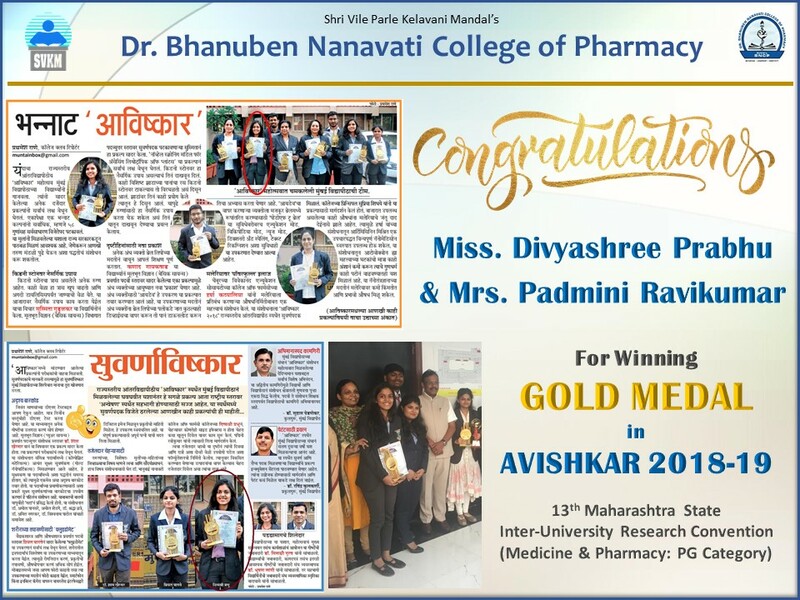 Ms. Divyashree Prabhu, a PG student of SVKM's Dr. Bhanuben Nanavati College of Pharmacy bagged Gold Medal at AVISHKAR 2018-19: 13th Maharashtra State Inter-University Research Convention (Medicine & Pharmacy: PG Category). 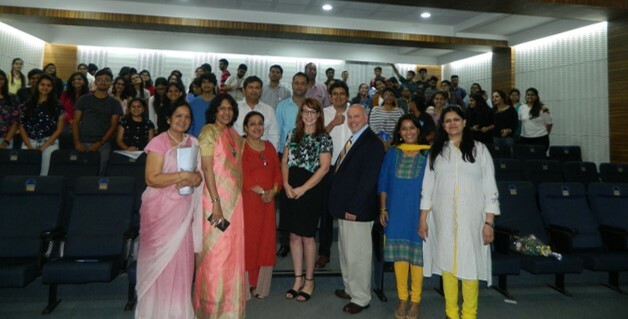 She was Guided by Mrs. Padmini Ravikumar for this Research project. Heartiest Congratulations to the Student and the Guide. 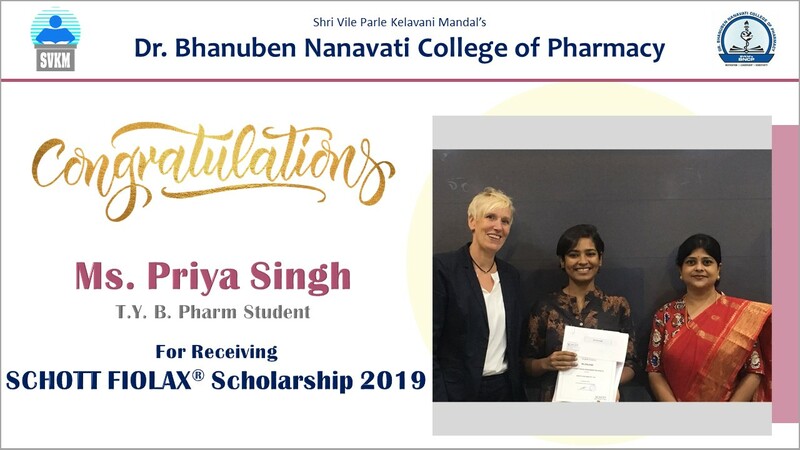 Ms. Priya Singh, a Third Year B. Pharm student of SVKM's Dr. Bhanuben Nanavati College of Pharmacy received Schott-Fiolax Scholarship 2019. We Heartily Congratulate her for this achievement . 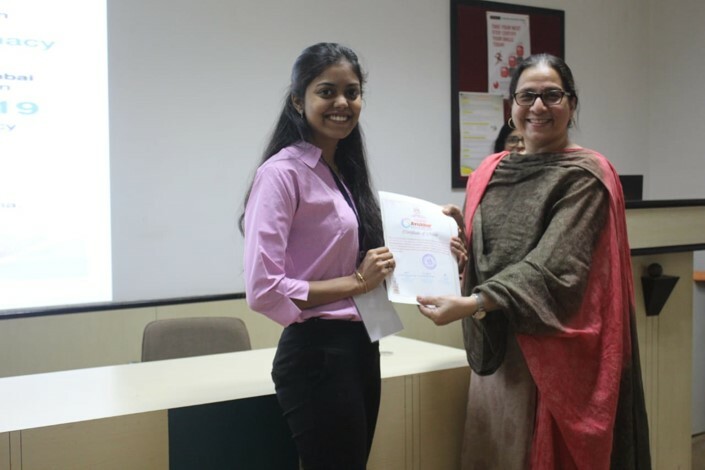 Silver medal bagged by Ms. Divyashree Prabhu at "Avishkar Research Convention 2018-19"
Ms. Divyashree Prabhu, a M. Pharm student of BNCP bagged Silver medal at "Avishkar Research Convention 2018-19" in University level final round. 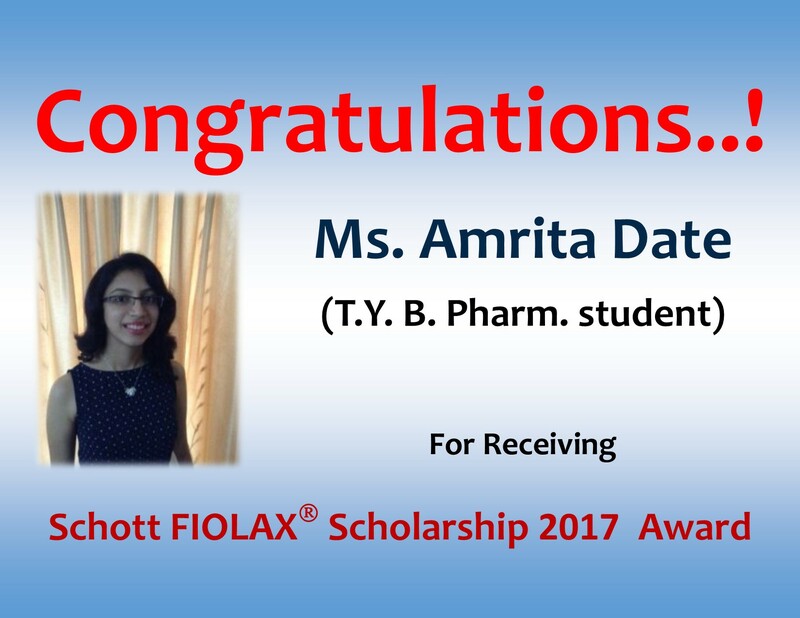 She will represent University of Mumbai (Category 6- Medicine & Pharmacy) at State Level. 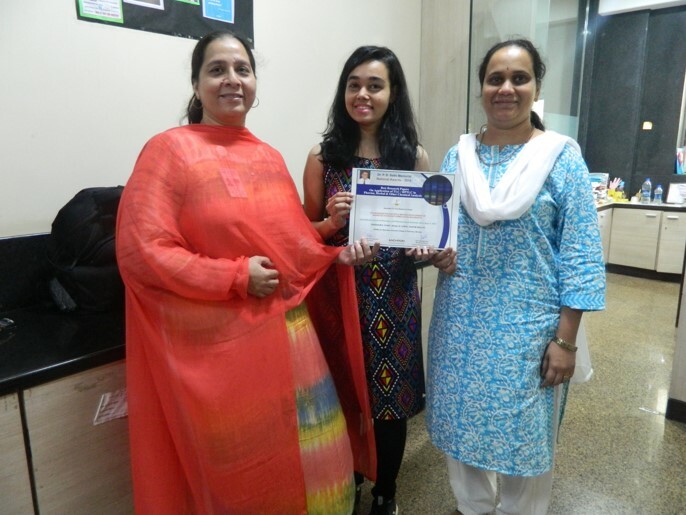 She was guided by Mrs.Padmini Ravikumar, Asst. 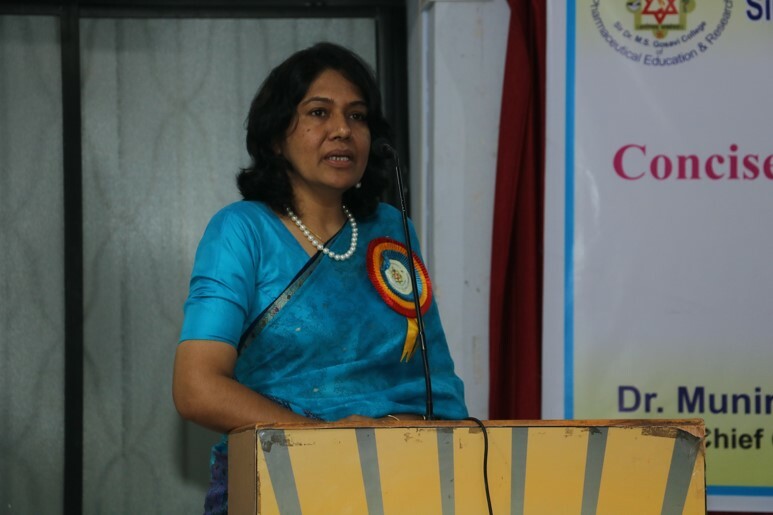 Profesor, SVKMs' Dr. Bhanuben Nanavati College of Pharmacy, for her reseach project. 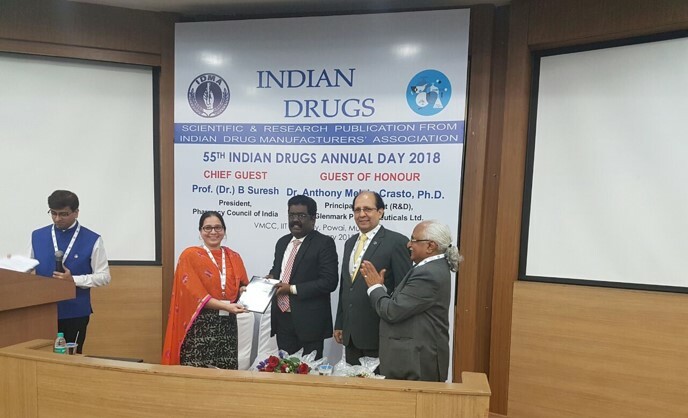 Dr. Tabassum Khan was felicitated by the University of Mumbai at the hands of Padmashri Dr. G.D. Yadav, Hon.Vice Chancellor ICT and Dr. Suhas Pednekar, Hon.Vice Chancellor University of Mumbai for her role as AVISHKAR 2018-19 Co-coordinator in Category 6- Medicine & Pharmacy in a glittering function held at the University of Mumbai, Fort Campus on December 24, 2018. 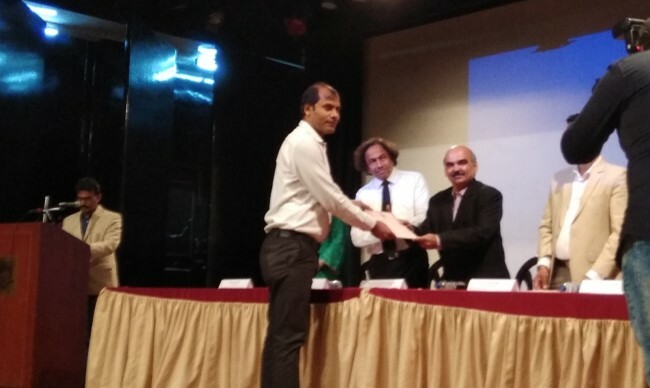 Dr. Atul Sherje, LOC member AVISHKAR Research Convention 2018-19 received the appreciation award and felicitation on behalf of the college for hosting the Selection Round of at the auspicious hands of Mr. Deepakkumar Mukadam, Hon. 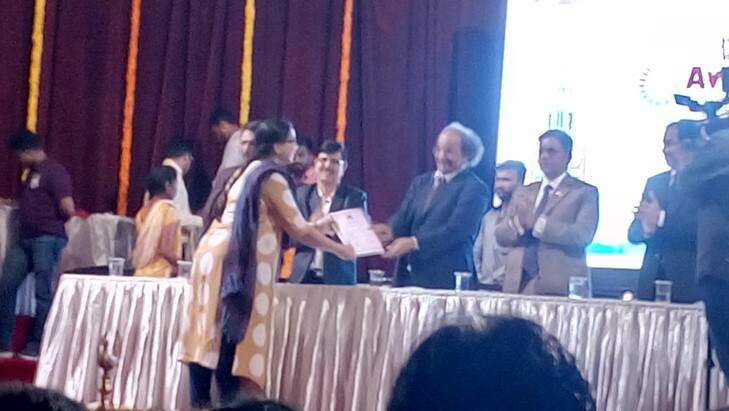 Chancellor’s nominee, University of Mumbai at a glittering function on December 29, 2018 at R.D. National College, Bandra, Mumbai. 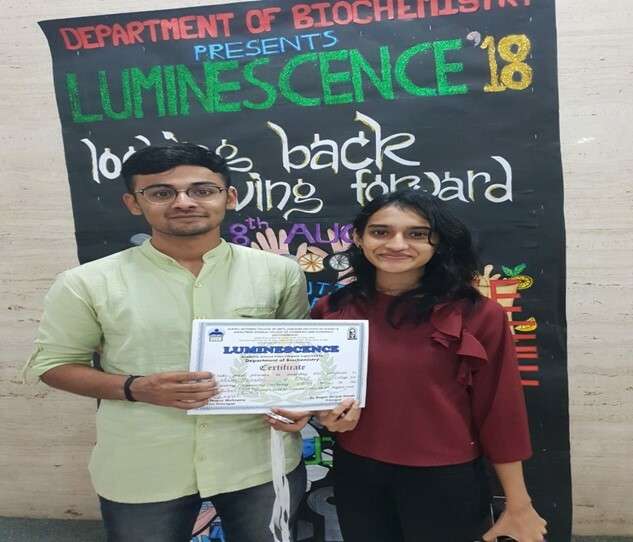 Shubham Mewada and Prajakta Rao secured the second position in InQuizitive event of Lunescence competition 2018 organised by Mithibai College, Mumbai on 8th August, 2018. 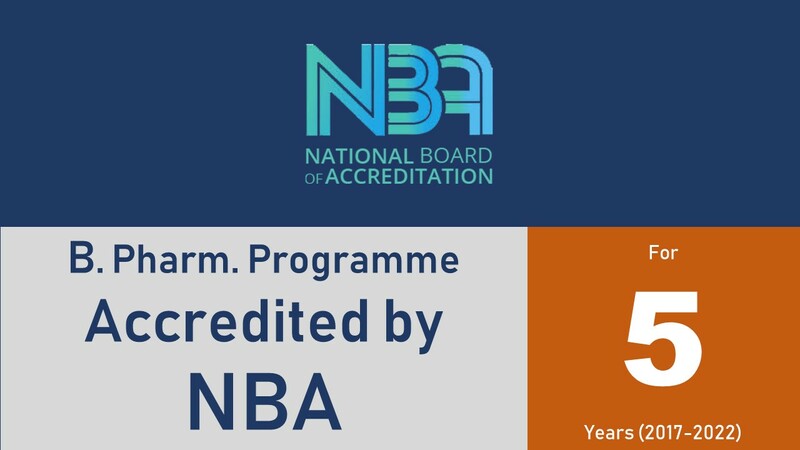 Best College Award in "HEPATHON 2018"
Dr. Munira Momin was invited as a speaker at Two days workshop on "Concise concepts in National Board of Accreditation (NBA)" organised by GES's Sir Dr. M.S. 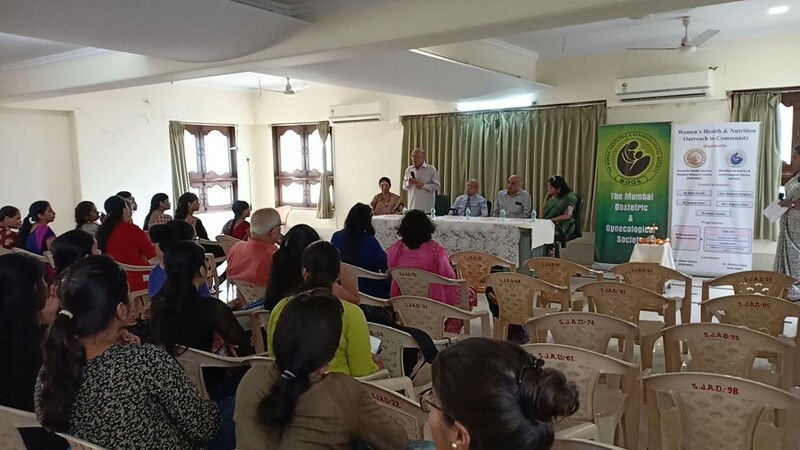 Gosavi College of Pharmaceutical Education & Research, Nasik on 12th and 13th April, 2018. 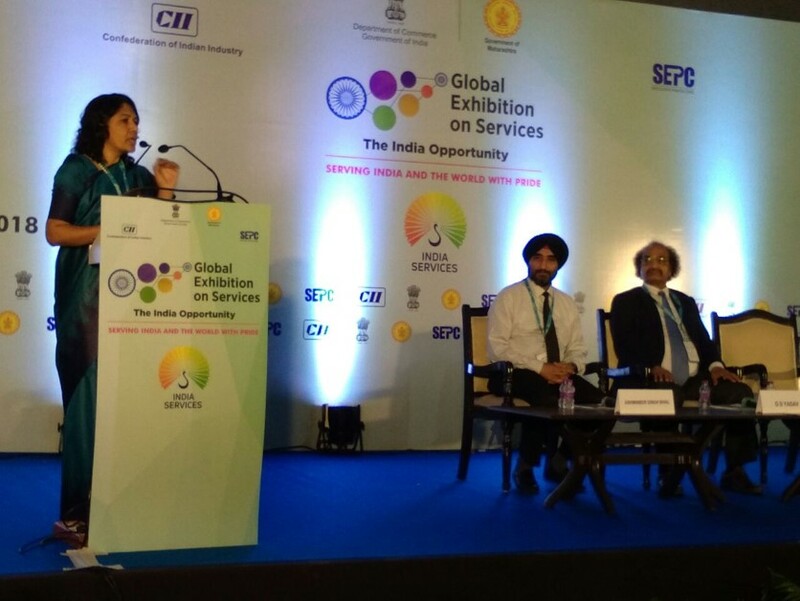 Dr. Munira Momin invited as a speaker at "Global Exhibition on Services"
Dr. Munira Momin was invited as a speaker at GLOBAL Exhibition on services on 17th May 2018. 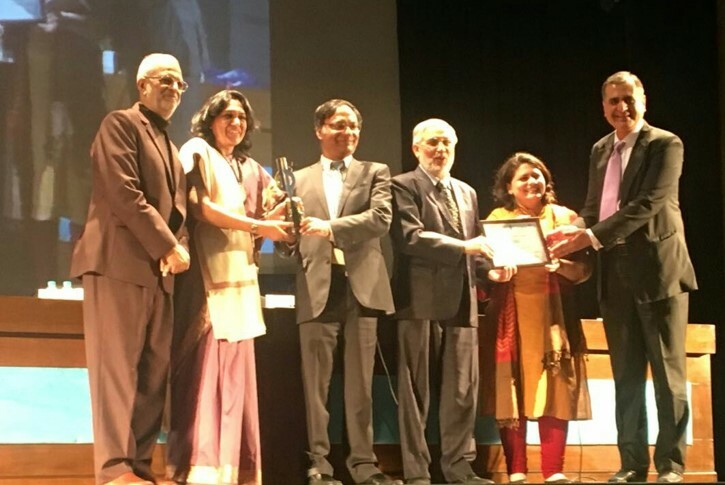 Dr. Tabassum Khan was awarded the “Dr. 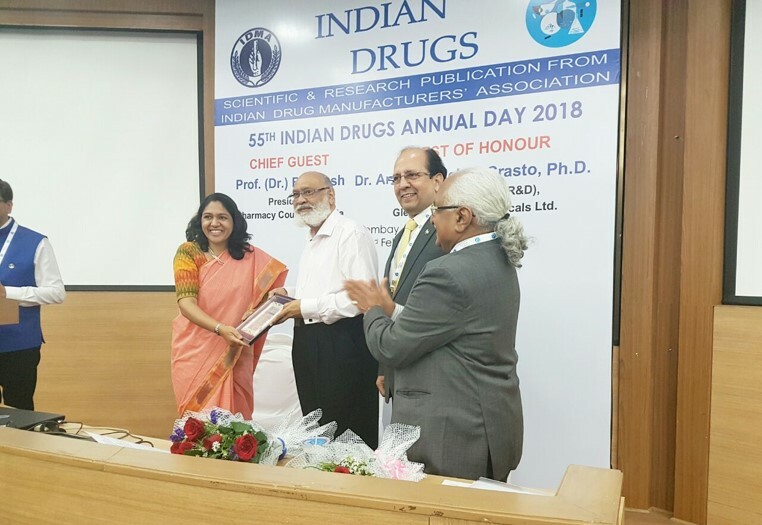 P. D. Sethi Memorial National Award 2016” for the Best Research Paper on “Application of TLC / HPTLC in Pharma, Herbal and other Analysis” for her research paper titled, "Standardisation and HPTLC method development of marketed ayurvedic formulation–Balarishta" co-authored by Ms. Rashmi Mallya and Ms. Anjali Gohel. 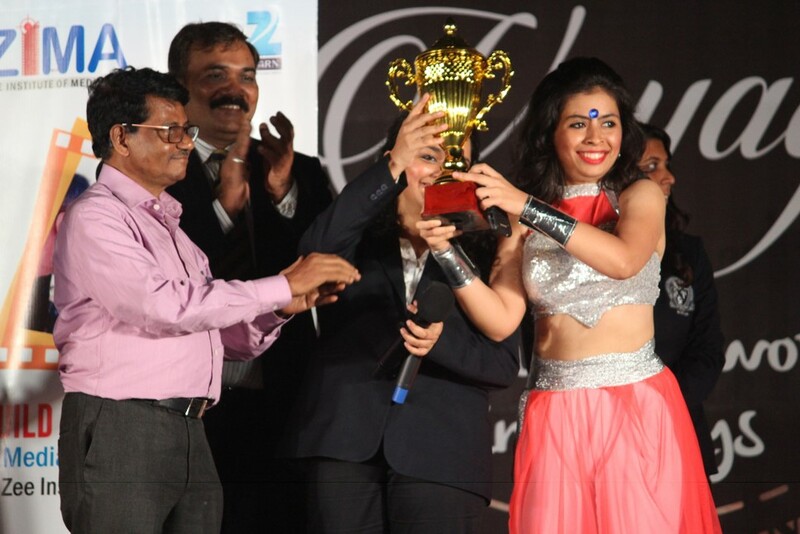 This National level award is sponsored by Anchrom Enterprises Pvt. 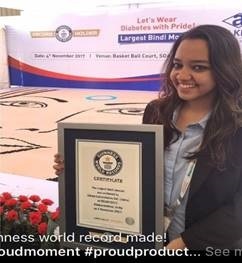 Ltd.
BNCP Alumni, Ms Richa Thakur ( Batch 2012-13), has made a Guinness World Record in Largest Bindi making out of Blister packaging material during the event "Let’s wear Diabetes with Pride”, held at Bhubaneswar on 4th November 2017. Curently, she is working at Alkem Laboratories. BNCP was felicitated for their PHO activity efforts taken for blood donation. The college was felicitated at the event organized by Rotary club and Nair Hospital Blood Bank Cell on 18-02-2017. BEST COLLEGE trophy for consecutive SIXTH Year. 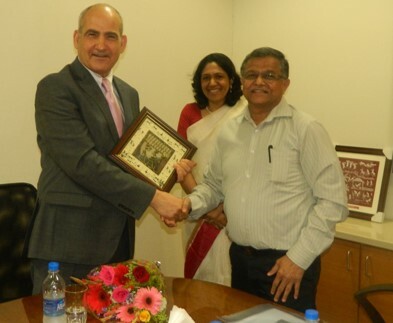 Career guidance and Placement cell of the college in association with Geebee Educational Pvt.Ltd organized a guest lecture of the International Speaker, Dr. Stephen Amato, Faculty Director of Graduate Regulatory Affairs and Life Science, North Eastern University on 4th October 2018. 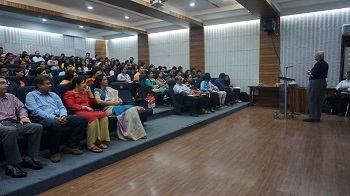 The primary objective of the Guest lecture was to give the overview of North Eastern University Courses and admission procedure and guide them in their career path. 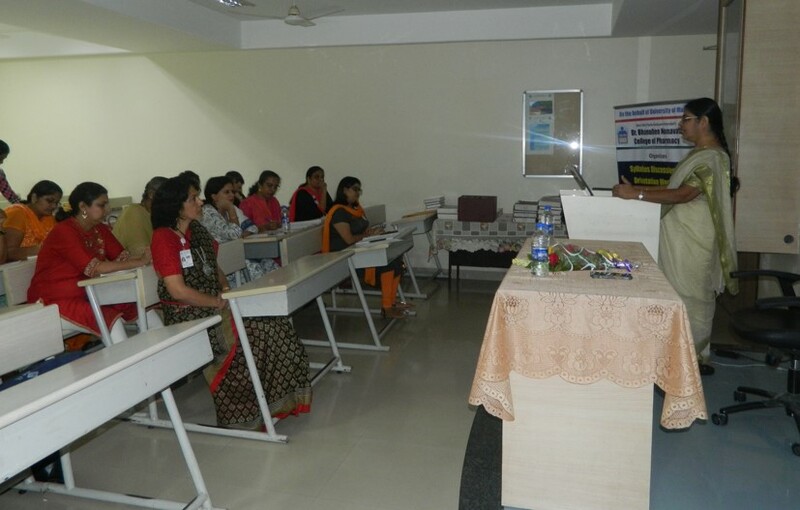 Career counselling seminar was organised for M. Pharm. students on 29th Sept 2018. 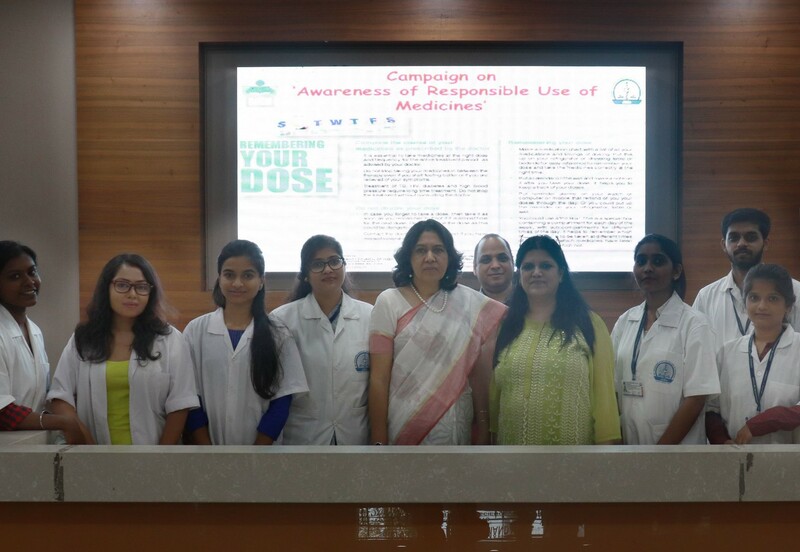 SVKM’s BNCP celebrated World Pharmacist Day on 25th Sept, 2018 by hosting various events- (1) Campaign on “Awareness of Responsible Use of Medicines; (2) Workshop on ‘Creating Clinical Research Awareness; (3) Camp on ‘Women Health and Wellness’ & Symposium on ‘Menopause: A Path to Bone and Muscle Health- 24 & 25- 09-2018. 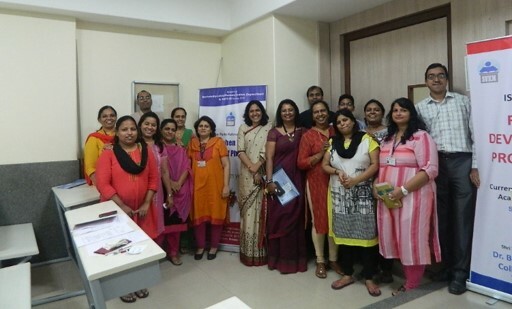 Symposium on "Women Health and Wellness"
SVKM’s Dr. Bhanuben Nanavati College in collaboration with Medical Research Centre, Kasturba Health Society (MRC KHS) and Mumbai Obstetrics &Gynaecological Society and Mumbai Menopause Society organized Camp on ‘Women Health and Wellness’ on September 24th, 2018. This event was organized one day prior to World Pharmacists Day. 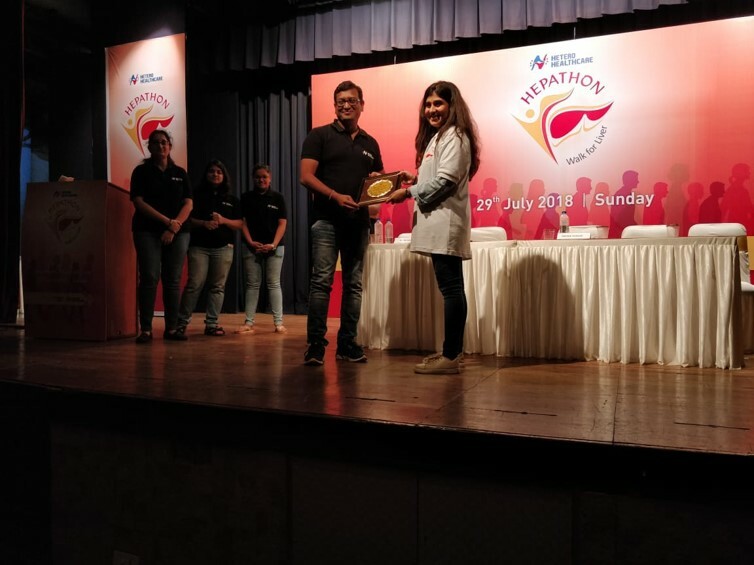 SVKM’s Dr. Bhanuben Nanavati College in collaboration with Medical Research Centre, Kasturba Health Society (MRC KHS) and Mumbai Obstetrics & Gynaecological Society and Mumbai Menopause Society organized Symposium on "Menopause: A Path to Bone and Muscle Health" on September 25th, 2018. This was one of the events to commemorate the world Pharmacists Day. The college has organized one day Career Counselling Seminar entitled UNLOCKING PHARMACY CAREER POTENTIAL on Saturday 21st July 2018 for Final Year B. Pharm and M . Pharm students. 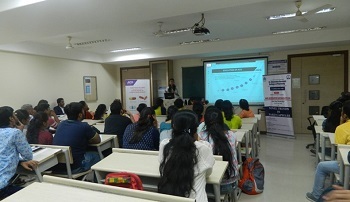 "Syllabus discussion and orientation workshop" organised on behalf of University of Mumbai for T.Y. B. Pharm. Pharmaceutics subjects on 16th July, 2018. 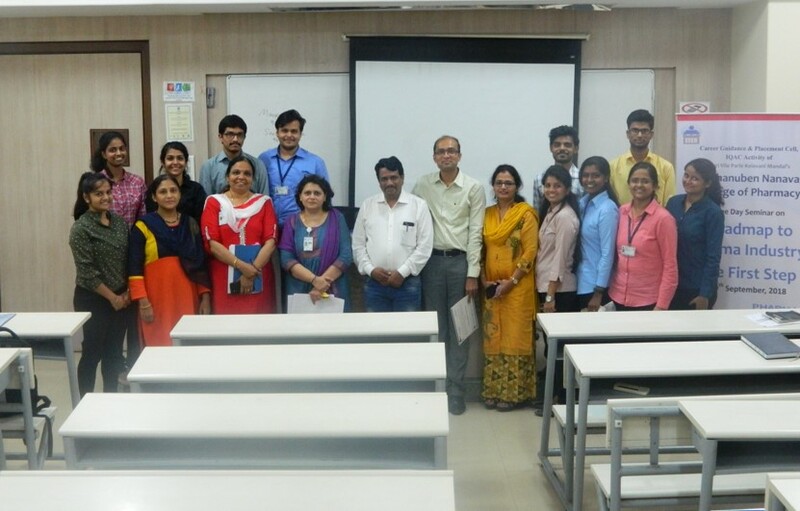 On the behalf of University of Mumbai, SVKM’s Dr. Bhanuben Nanavati College of Pharmacy organized syllabus discussion and orientation workshop of Pharmaceutics subjects (Pharmaceutics II, Pharmaceutics Lab II, Cosmeticology, Packaging Technology, Pharm. 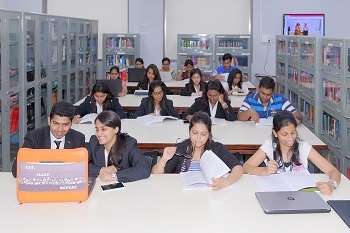 Biotechnology and Pharm. 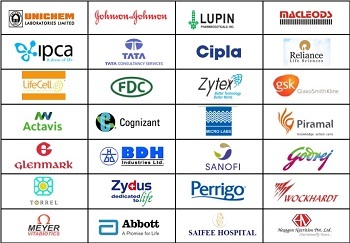 Biotechnology Lab) for T.Y.B.Pharm CBCS, on 16th July 2018. 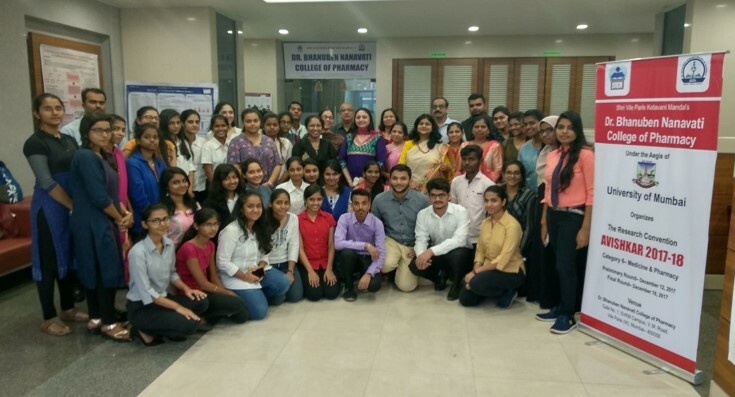 Workshop on "Novel trends in Hard Capsules"
A workshop on "Novel trends in Hard Capsules" was organised by college in association with "ACG Associates" on 6th July 2018. 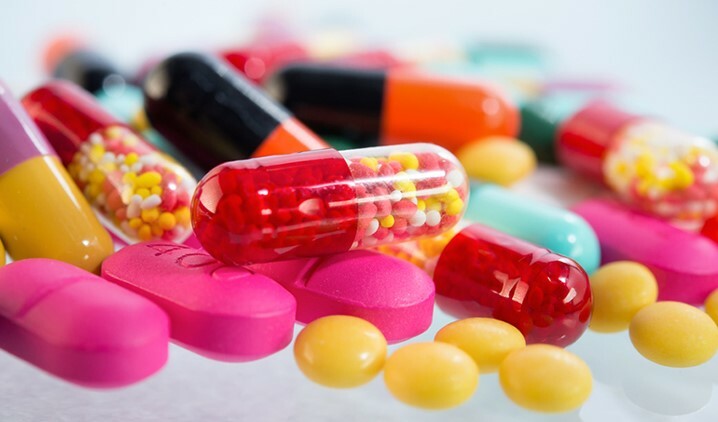 The objective of the workshop was to explore the various novel trends in the hard capsules including the capsule shell, capsule fill material, capsule sealing technique, and different capsule systems to achieve modified drug release, encapsulation of various kind of materials. 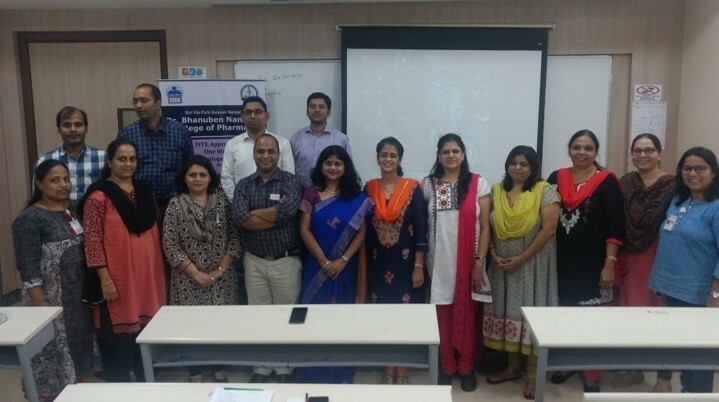 A one week Faculty Development Programme on "Screening Methods in Pharmacological Research was organized by SVKM's Dr. Bhanuben Nanavati College of Oharmacy from 4th Dec to 9Th Dec, 2017. 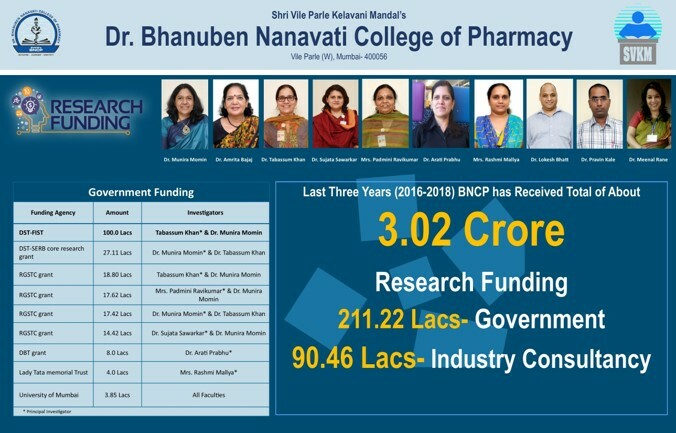 In last three years (2016-18) BNCP has received total of 3.02 Crore Research Funding: 211.22 Lacs from Government & 90.46 Lacs from Industry Consultancy. B. Pharm. 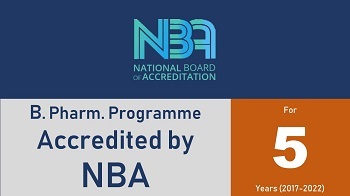 Programme of BNCP received Accreditation by National Board of Accreditation (NBA) for 5 years (Academic year 2017-18 to 2021-22). 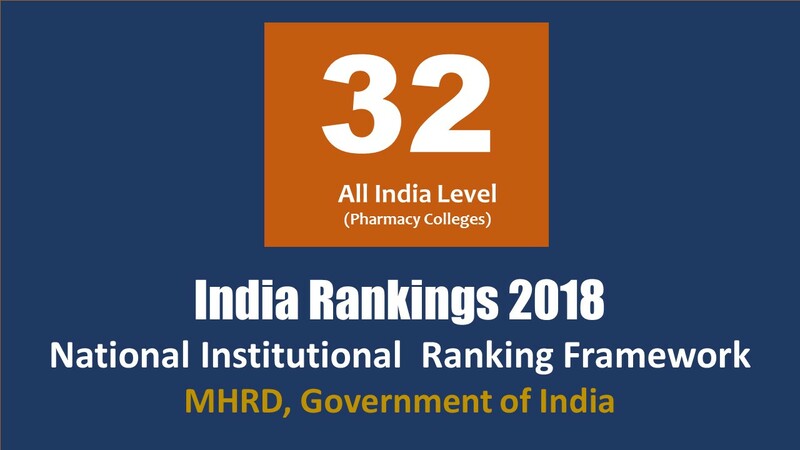 BNCP is ranked at 32nd position in All over India Pharmacy colleges and 4th Position in the city of Mumbai (Pharmacy colleges). DAYITVA "VISIT TO OLD AGE HOME" BNCP social sensitivity cell "Dayitva" had visit to an age care centre in Mumbai "Assisi Bhavan".